CycloneIIEP2C5T144 by ALTERA chip as the core of the company's smallest system, the FPGA easily embedded into the application system. completed from simple logic control, data acquisition, signal processing, mathematical calculation. 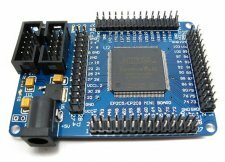 core board FPGA chip, all the leads all the pins, you can apply directly to the board into the board. 5V on the board can plug into the power supply can also be introduced through the vent array. a very compact size: 6 * 8 cm. Onboard 3 chip LED, LED test can do experiments, more experiments completed by lead. All through the IO port pin and clock pin leads, through these interfaces can be extended to any memory and peripherals.